"Designed to spiritually guide anyone who wants more than just a surface reading of the Bible, these 52 weekly studies emphasize personal application and have been written to draw readers directly into God's Word … in order to love Him more. In this roll-your-sleeves-up look at Scripture, each of the studies begins with a short reflection tied to the present day, providing a springboard into the various passages presented from the Old and New Testaments. Then, in a refreshing departure from the typical bible studies in the marketplace, the author doesn't explain what the passage means or offer support on what she feels God is trying to say from Scripture. 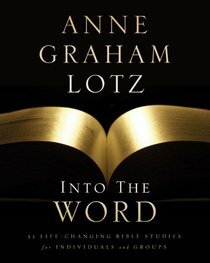 Instead, Lotz asks dozens of questions in each study, prompting readers to personally dig into Scripture and discover God's specific message for themselves. " Anne Graham Lotz is daughter of Billy and Ruth Graham, is the President and Executive Director of AnGeL Ministries, a non-profit organization offering Christian outreach. Anne has spoken on all seven continents in more than twenty foreign countries, proclaiming the word of God at seminaries, colleges, conferences and revivals. She has written many other books, including The Vision of His Glory, God's Story, Just Give Me Jesus, My Heart's Cry, and Heaven. Anne and her husband, Daniel, reside in Raleigh, North Carolina.